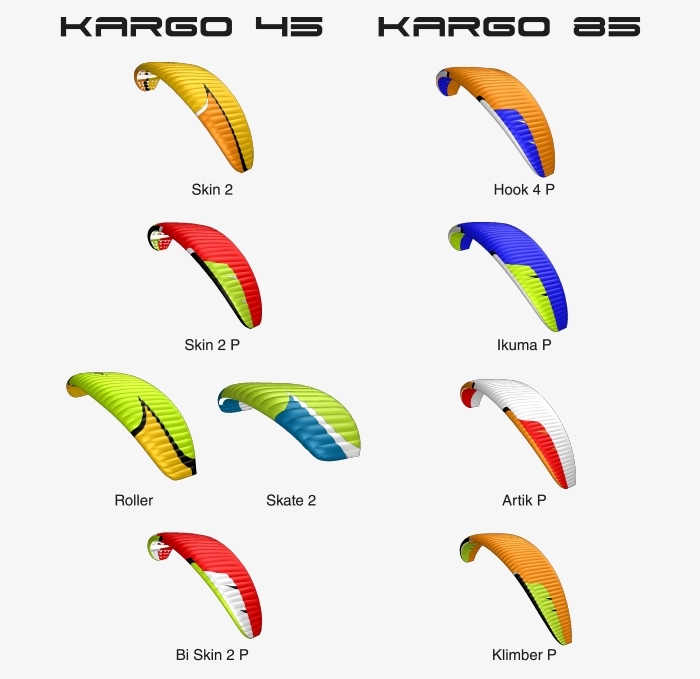 Kargo 45: Skin, Skin 2, Skin 2, Skin 2 P, Roller, Skate 2 and Bi Skin 2 P.
Kargo 85: Hook 4 P, Ikuma P, Artik P and Klimber P.
I got the Kargo 45 to accompany my Skin P. I had to wait a while between purchasing the Skin and receiving the rucksack (which was not then available but expected to be released soon) but it was definitely worth the wait. It's much bigger than needed just for carrying a Skin P with a string harness, helmet and reserve, but I wanted the Kargo 45 for its extra capacity with multi-day hike and fly trips in mind. Hence when reviewing this rucksack I am considering it not simply as something to hold all the paragliding gear needed for a day's flying where the only walking is from car to hill and landing to car, but for its suitability for extended hiking with paragliding and other gear for days out in the hills. Featurewise, it appears well constructed, with good quality fabric and stitching. It weighed 617gm on my scales. Size-wise, I found myself cinching the shoulder straps down to almost the very limit of adjustment - I am short at 5'4" so people shorter than this might find the back length a bit on the large side. It has one large compartment with an asymmetric zip - it opens further down one side than the other, I suppose this allows using a shorter zip and saves a bit of weight. The main compartment has an outlet for hydration and a single velcro 'hook' which could be used for hanging a bladder. Here would be my first criticism, in that I think it would be useful to have a pocket inside to actually hold and support a bladder in place. It has a outer pocket at the back, and inside this is another zipped pocket, these could be used for instruments, documents and the like, and below this an elasticated panel of the kind that is most often found on cyclist backpacks as a helmet carrier. It will fit a cycle helmet nicely, it will even fit a climbing helmet and allow it to be carried externally leaving more room internally. Trying to fit a paragliding helmet however seems impossible or at least inadvisable - it seems like it would either stretch the elastic and stress the stitching too much, and/or it would be at risk of popping out while hiking. 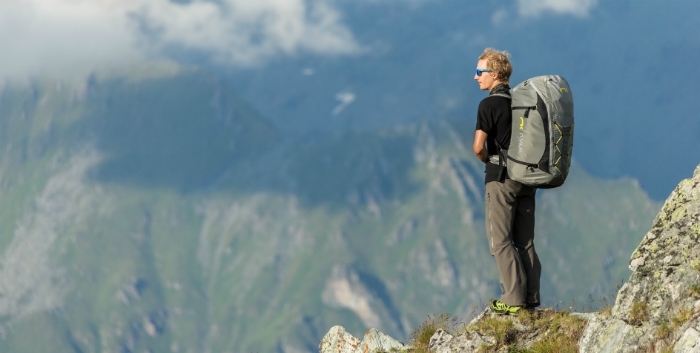 If it was intended as a paragliding helmet carrier it needs to be bigger/more expandable. However the feature is useful and it can of course be used to carry something else instead - my lightweight bivy tent fits in it nicely, a waterproof or windproof shell or anything you might want access to without opening the pack could be put there. 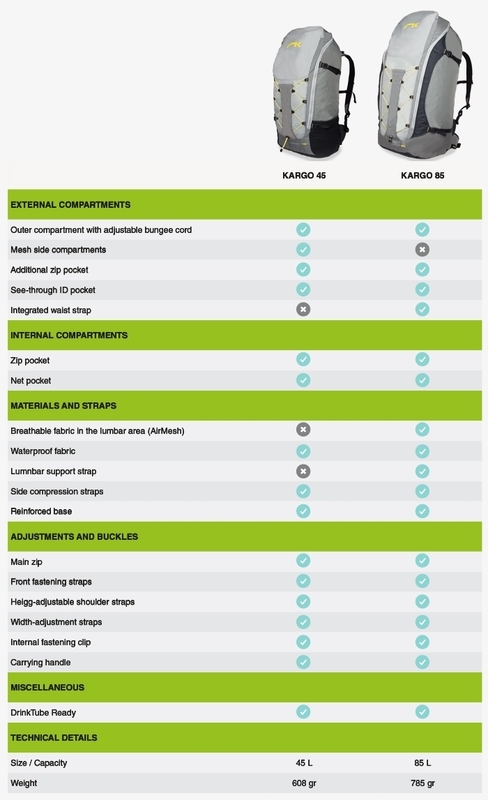 The Kargo 45 does come with a waist strap, despite the spec suggesting that it doesn't. This is important as firstly, if a pack is heavily loaded ('heavy' is a relative term) you ideally want a waist strap to help transfer weight from than the shoulders to the hips, and secondly and perhaps more importantly, when flying with a pack that isn't physically attached to a harness I for one want a waist strap to help keep the pack attached to me! It's just a webbing strap though, and I always see rucksack waist straps that don't have pockets as a missed opportunity - so useful for easy access to snack bars or small bits and pieces when walking without taking the pack off. Like all good rucksacks it has a height-adjustable sternum strap, and here is another missed opportunity - a lot of rucksacks have a whistle built into the sternum strap clip, but the Kargo doesn't. I find this a useful safety feature for negligible weight penalty. The Kargo 45 has the usual side compression straps to allow the pack to be compressed down when not fully loaded, but Niviuk has chosen to use ladder lock buckles here rather than side release buckles. I much prefer the latter as this allows the compression straps to be fully opened up and threaded through anything you might want to attach externally to the pack, helping secure it in a way that you can't when the strap can't easily be taken out of its ladder lock - it's more fiddly anyway even if it can. It has elasticated side pockets which can be used to hold drink bottles or anything else. They expand enough to hold a lightweight tent, which is always something I look for as that's often where I put my tent on hiking trips! The rucksack lacks any iceaxe or pole loops however, and that's another pity. 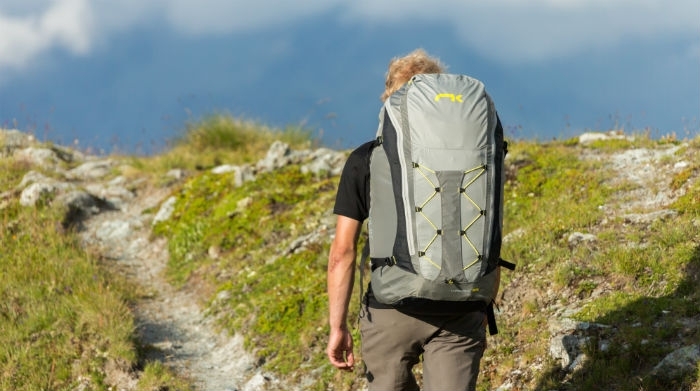 All in all this appears to be a sturdy, well thought out pack that is almost perfect for multi day hike and fly adventures with a lightweight wing like the Skin P. Small changes however could have made it even better, without adding significantly to the weight.